On April 13th 1791 Watkin Tench, a young officer in the Marines, recorded a meeting on the banks of the Hawkesbury river between Arthur Phillip, Governor of New South Wales and members of the Boorooberongal clan of the Darug. We halted for the night at our usual hour, on the bank of the river. Immediately that we had stopped, our friend (who had already told us his name) Gombeeree, introduced the man and the boy from the canoe to us. The former was named Yellomundee, the latter Deeimba. The ease with which these people behaved among strangers was as conspicuous, as unexpected. They seated themselves at our fire, partook of our biscuit and pork, drank from our canteens, and heard our guns going off around them without betraying any symptom of fear, distrust or surprise. On the opposite bank of the river they had left their wives and several children, with whom they frequently discoursed; and we observed that these last manifested neither suspicion or uneasiness of our designs towards their friends. [Sydney’s First Four Years pp. 229 – 230]. Since the establishment of the Protection Board in 1883, Darug families, like other Aboriginal families in New South Wales, had suffered increasing government interference with their lives including the removal of children. Despite this William Stubbings, the son of Martha and William, was amongst those who sought to fight in Britain’s colonial war in South Africa. My great Grandpa was William James Stubbings. His son, Stanley William Stubbings, my much loved Grandpa left me as custodian of his dad’s Boer war medal and photo. 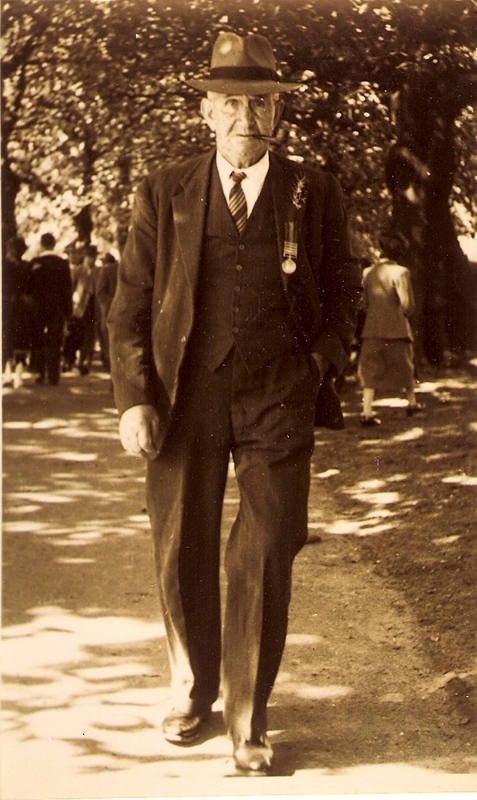 I also have a copy of a much later photo of Great Grandpa marching on Anzac day with his medal proudly displayed. William Stubbings’ Queen’s South Africa Medal courtesy Kym Stubbings. a silver and bronze medal with the crowned and veiled head of Queen Victoria on the obverse. The reverse has Britannia with a flag in her left hand holding out a laurel wreath to a party of advancing soldiers. In the background are two warships. Below the wreath the dates ‘1899-1900′ are shown. [Note these are not apparent on this medal] Around the top are the words ‘SOUTH AFRICA’. The regiment travelled to South Africa in three group: B and D Squadrons were the first to leave Australia, sailing from Sydney on 15 March, on board the transport Maplemore; A, C, and E Squadrons, and the regimental staff, followed six days later on the British Princess. The machine gun section also left on 21 March, travelling on the transport Ranee. B and D Squadrons disembarked at Port Elizabeth on 12 April, while the rest of the regiment disembarked at Durban on 17 and 23 April. … From 2 May 1901 to 28 April 1902 the regiment served in the eastern Transvaal and in eastern Orange Free, attached to Colonel Remington’s column. In early 1902 it took part in several drives, the principal one being the Harrismith drive, which resulted in the capture of 251 prisoners, 26,000 cattle, and 2,000 horses. In February 1902 the regiment was in action during the Boer breakthrough at Langverwacht. In May the regiment embarked at Cape Town for Australia, leaving on 4 May and reaching Sydney on 3 June, after having stopped at Albany, Adelaide, and Melbourne. 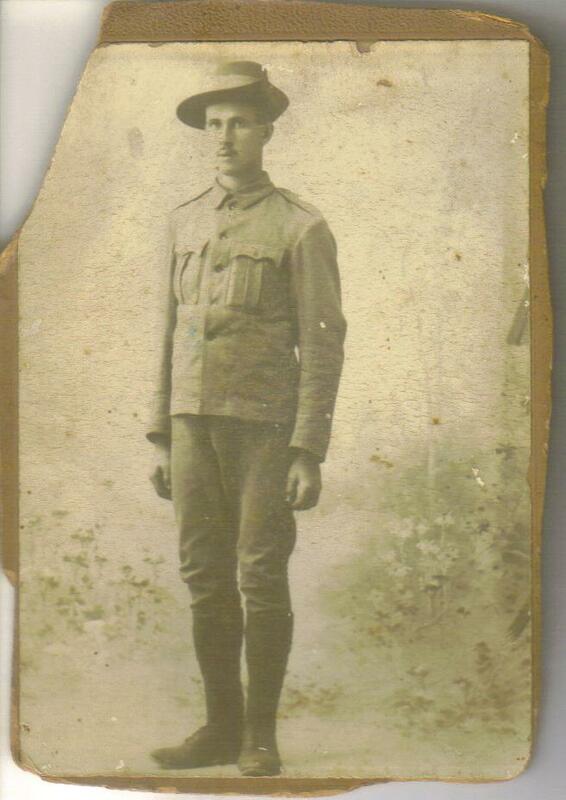 There is no evidence that this William Stubbings served in WW1, but the photograph belonging to his great grandchild Kym Stubbings shows that he marched on Anzac day. This image probably dates from the 1940s or 50s. William Stubbings died in 1957. His Boer war medal is worn below the rosemary on his left lapel. This photograph plus the portrait of William Stubbings in uniform and his Queen’s South Africa Medal, are possibly the only objects now existing which specifically relate to the service in the Boer war of a man of Aboriginal heritage. This entry was posted in BOER WAR. Bookmark the permalink. Thank you for bringing the history of William Stubbings to the attention of the General Public. The service of such men in the Boer War particularly is very much misunderstood and neglected. I note your posting on the “Desert Column” forum and would draw your attention to some very detailed research which has been conducted by a number of members on that forum in an effort to properly identify Trooper King who served as a “Black Tracker” with one of the NSW Boer War contingents. His photograph has been found and verified with the unit, his embarkation has been verified but his name is NOT listed on the relevant unit Awards roll and this is most certainly a miscarriage of the system which should be rectified. A number ( seven to eight) Aboriginal Trackers who served throughout the Boer War with various units have been shown to have served from available letters and other records of the time but unfortunately their names have not been preserved. Efforts have been made via various Aboriginal groups and Associations to identify Trooper King without success.and we would welcome any assistance which followers of your blog can give in order to properly identify this man and allow efforts to be made to have him properly recognised as a member of the Australian Forces in that conflict. That particular medal is a Type Two Version of the Queen’s South Africa Medal 1899-1902 where Britannia’s wreath points to the ‘F’ of Africa, and the dates of the original Type One version have been erased because the war dragged on longer than expected, giving ‘ghost dates’. What is really interesting about this medal is that Stubbings’ unit, the 3rd NSW Mounted Infantry, was not entitled to the Cape Colony clasp. This would most likely indicate that Stubbings served also with another unit, such as the NSW Imperial Bushmen, the 3rd NSW Imperial Bushmen, or the 1st Australian Commonwealth Horse, or possibly a unit from another state. This scenario would best be proven if the Cape Colony clasp was one of the 3 still attached to the medal. By straining my eyes, I believe it is the one closest to the suspender.. Cheers.